Two summers ago, I fell in love with Jenna Butler’s writing from one hundred feet up in the air. With my legs dangling lazily over the edge of my fire tower window, I devoured her book of essays, A Profession of Hope: Farming on the Edge of the Grizzly Trail. Jenna is an Albertan author, creative writing professor, organic farmer, and explorer. Her words on land, labour, feminism, and the boreal forest reverberated in my bones. Jenna recently published her seventh book, Magnetic North: Sea Voyage to Svalbard, published by the University of Alberta Press, about her journey aboard a sailing vessel, traveling to the Svalbard glacier archipelago off the coast of Norway. The book is a travelogue of stunning prose that scrapes beneath the surface of traditional exploration narratives to the polar North. Jenna’s writing is constantly reaching, feeling towards the deeper currents of story — those stories often forgotten, overlooked, underestimated. In Magnetic North, Jenna weaves a story that travels back and forth between Norway’s “old ice” and the Canadian boreal forest. She invites readers into her heart, mind, body as she contemplates the physical and emotional magnitudes of climate change and impending environmental shifts. Her prose moved me, deeply. Recently, I had the enormous privilege of interviewing Jenna about her sea voyage to Svalbard — a “hard land of few women” — and how Magnetic North was birthed, somewhat unexpectedly, into creation. Why are you drawn to the North? What motivates a woman to travel aboard a sailing vessel for two-weeks through the Norwegian Arctic? Jenna: I love the north because of the challenge of seeing the beauty. You have to work harder with the land, not just to find a sense of place for yourself within it, but to find the aesthetic that gets you through every day. You’re looking harder at the light and the shadows on the snow. The quality of the branches against sky. Or, if there’s no trees, the quality of rock and light. I applied for the residency because I was interested in early air exploration of the Norwegian Arctic. During the 1920s, the early air exploration was by airship. There was a pretty spectacular airship crash right where the voyage was going to be taking place – I thought, I want to go there, I want to look at that element of arctic exploration, like of all things, why would you take an envelope of air over the Arctic? It seemed crazy! Where are the women? They are raising the children and tending the dead, navigating each morning around the sheen of ice on the FLOOR, the vast bulk of Spitsbergen hovering like a hallucination. They are the ones for whom the north remains mythic and terrible. How it pries into their men and calls, calls. An altered interior country, even if the men come home again. We learn what the explorers knew: that darkness is not a right but an indulgence. You do what you need to find it: the bar is open as long as the sun is up. Love, too, is a kind of darkness, a momentary way of abandoning the body. Forget where you left yourself. Don’t look for tracks. You traveled for two weeks aboard a Norwegian ship, “thirty people in six hundred squared feet.” How did you deal with the extremes of traveling through a vast expanse of sea and ice – yet in a kind of cramped togetherness? Jenna: I went expecting vastness and looking closely but – being an introvert – I didn’t realize how much the human element would impact me. We were writers, artists, musicians, scientists, polar bear guards, and the ship’s crew, from all over the world. Aboard the ship, our common space was very small. Our rooms were shared; eight by eight-foot bunks with a tiny little washroom cubicle. There was no place to go to be alone. Even when we reached land, we couldn’t go off alone because of the threat of polar bears. We were not out of each other’s company for two weeks. Most people were going through the cycles of missing home, of feeling friction and anger, of being overwhelmed, of being awed. At the peak of solstice, there was twenty-four hours of daylight. There was a sense of being on display 24/7. If you had a hard day, there was nowhere to get away to process. Even at night, there was no darkness; there was no letting it down. In your chapter, The Men at the Edge of the World, you write that “it is a hard land of few women”. Can you tell me about the women you met on Svalbard? Jenna: In some of the mining towns, there were women and families there, too. But I found that women were often ‘off script’. Men had scripted work: they were the miners, or involved in tourism, or scientific exploration. The women were predominantly the wives of the miners, trying to fashion a community in such a nebulous space as the arctic, where you’re dealing with so many months of intense dark, cold, and distance. Around some of the mining communities where we visited, there’s also been a lot of environmental degradation. Women had to live in that, raising their families, and trying to find some cohesion. Many of the women I met were very strong in their ability to go on, to sustain, to set up their lives, to provide support. On Svalbard, I met women who worked in the tourism industry. They were amazing women, setting their own boundaries, and pitching themselves against this place with a history of ignoring women. They were purposely bringing their presence to that place. Additionally, all of the polar bear guards on our trip were women. Women in this place are conspicuous in absence, though whalers tend the ovens day and night through the long Arctic summers to make lamp oil and soap. They comb the corpses for baleen to be fashioned into parasols and corset stays. This place of no women is stripped, scraped, ensed, boiled in iron; piece by piece, it is dismantled and sent back over the water. Jenna: There were three of them – all women. They had high powered rifles. You can’t go anywhere on Svalbard without a gun. The polar bears are out there, they’re wild, and they wander into town. In some of the communities, people leave their doors unlocked in case someone is being chased by a polar bear and they need to run into your living room! The polar bear guards were in charge of keeping us safe. Polar bears can stalk you from a long way away. We’d travel in Zodiacs from the ship to the shore. When we made landfall, the women would go in first and they would triangulate their distances, ensuring the area was clear of bears. In my book, I called the women “Vikings with high powered rifles” and they really were. They were amazing women: independent, and self-determining. They spent most of the summer on Svalbard, then during the winter, the long, dark season, they’d go and travel the world. She stays through the long indigo nights as October devours the sun, takes her dog for a last run by lantern light, skirting the toe of the moraine. Her father’s rifle rings against her shoulderblade like winter as she sights the dark for bears. What was it like to witness the glaciers, what you described as “old ice”? Jenna: You can prepare your mind for what you’re going to see, but there’s no way you can prepare your heart. You can read, watch documentaries, but it still punches a hole right through your heart. It was incredible. I spent so much time up on deck watching the glaciers. You could see and hear them, all day and night, calving. It was astonishing to watch the sheets of ice, moving, the way the face of the glacier was constantly reforming itself. One day, we brought the boat fairly close to the glacier face, and one of the polar bear guards mentioned, casually, that it was the farthest they’d seen the glacier recede along the rock, in all of the years they’ve been traveling there. That really struck me. Each summer a little thinner, ice bruised by a malignant swell of mountain coming clear beneath. In a scant decade, there will be only rock; the swaybacked ridge of the glacier will be as much a memory as the whale pods darkening the inlets along Svalbard’s bank. In your chapter, Threads, you draw us back into the boreal forest and make these connections between glacier and forest. What changed for you, if anything, about the way you see the boreal? Jenna: I find so much of travel for me is about home. Watching the glaciers, I thought about what was immediately in front me, but I also thought of the boreal forest. I thought about the studies I’d been reading about the incremental change that will totally reconfigure the face of the boreal forest because this ecosystem can’t adapt beyond a couple of degrees Celsius. Once we shift outside their temperature range, the whole forest is going to shift. It’s going to change. I find myself wondering: what will be the forest that comes after? It’s not going to be the black spruce we have today. What is it going to do to the way the forest sequesters carbon? What is it going to do to the landscape? The wildlife? So much of what impacts Svalbard comes from away, waterborne. So much of what breaks my home comes up from beneath. The author, Jenna Butler, standing in front of “old ice” in Norway’s Arctic. Much of the way you’ve written Magnetic North defies the traditional “hero’s journey”, the way many exploration books have been written. What narratives do you think that the world needs today? Jenna: I think when I came to the Arctic with my original project about air exploration and the crash in the 1920s, it was kind of a cop out. Going for the male exploratory narrative, I want to say it was easy, in terms of access, which is almost always the story with male narratives – they’re easier to dig up than female narratives. They’re more publicized. They’re more apparent in many cases. Sometimes people are less, depending on the society you’re in, willing to tell them because of a perception that men can’t be vulnerable. But generally, the male narrative is more accessible. The crash of the Italia is a great story and could make an interesting book. But the writing process is about coming to a truth about what a story is. I was writing around what it’s like to be a woman in the world. Before my journey to the Arctic, I had learnt – and I talk about it very tangentially in this book – that I wasn’t going to have a chance at being a mother. When I arrived on the landscape, everything was breeding – oh my god – there were so many birds, so many whales. Everything was flowering under the twenty-hour hours of daylight. It was overwhelming with life. I was a woman who’d just been told, this is your reality, and here I was traveling to a landscape that’s “barren” as a woman who is “barren”, then realizing, there’s so much more. These labels – “barren” – are very reductive. They’re used to define us. They’re used to define places. Coming to that whole landscape while I was there and the fact that the book shifted on me from a male to female narrative, I think what I really wanted to write about was surfacing. I told myself, let go of the easy project. This is what the Arctic brings you when you think it conquered: a sudden seething of cloud, a rime of ice along the dirigible’s envelope. When you think you’ve mapped its boundaries, the north sends you reeling out of the sky with frost on your wings. In Leaving Days, you write: “We carry this space with us when we go.” Are you carrying anything from your travels in the Arctic today? What’s next for you? Jenna: What I can talk about is what I see down the path. I always feel like I’m writing towards something, like it’s coming towards me, and I’m writing towards it, and if I do the right work, it will suddenly come clear what it is. The whole trip was about being truthful with myself, going from what seems simpler, what could be a good book, but wouldn’t push me, personally as a writer, to something that is a lot riskier, but could take me places. I keep coming back to this, as a woman and a woman of colour, a woman who has experienced loss, as so many of us have, as to the roles we’re expected to have, as wives and mothers. How do we address what’s coming at us? How do we voice women’s stories? In terms of environmental breakdown? I don’t want to use the word ‘hope’ right now, in terms of climate, politics, racial and gender inequality, because I think you can get really stuck on hope – if it’s not immediately there, I think the idea of hope can get tangled around your feet and take you over. As women, it’s increasingly important to tell our stories. In many situations, part of the reason we’re in the tangles we’re in, in terms of the environment, politics, governance, is because the way women walk in the world is not recognized. Our stories aren’t heard. We offer balance. When we’re not heard, there’s not that balance. I don’t want that to sound clichéd. What’s coming to me down the road is the sense of needing to write about women’s stories and needing to write about our losses and resilience – that sense of pushing ahead, in spite of everything, including hope. We’re at a tipping point. We read in the news, or hear on the radio and wonder: are we past the point of no return with the environment? With politics? So how do we keep going anyway? Hope might leave us sitting on our hands, feeling ‘I don’t know what to do.’ But you have to keep going. Otherwise, there’s a lot of good-intentioned people who end up being apathetic – when hope goes out the window, what do you do? It’s less about finding levity than finding agency. It doesn’t necessarily have to be happy and positive. It’s the process of putting one foot in front of the other and seeing something change. Jenna Butler is an Albertan author, teacher, and explorer. 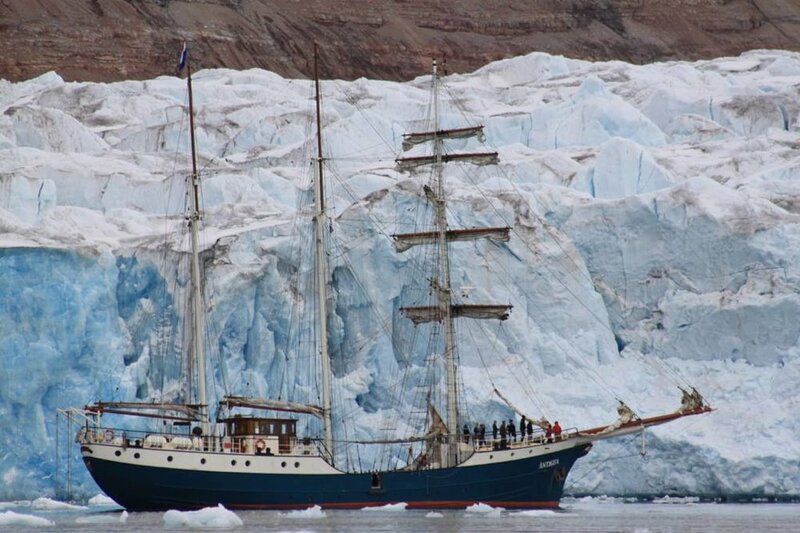 Magnetic North: Sea Voyage to Svalbard is her seventh published book. Visit www.jennabutler.com to learn more about her writing, work, and to find copies of Magnetic North, and her other books. Trina Moyles is an Albertan author, fire tower lookout, and wanderer. Her first book is Women Who Dig: Farming, Feminism, and the Fight to Feed the World. Visit www.trinamoyles.com to learn more about her work.